And, like so many important discoveries in science, this one started out with a neglected flask sitting in a storage fridge, in this case in the lab of Andrei Sanov, a professor in the UA's Department of Chemistry and Biochemistry. Sanov and two of his students report the first definitive observation and spectroscopic characterization of ethylenedione, or "OCCO," representing two carbon monoxide molecules chemically bound together. According to the researchers, the interest in this deceptively "simple" compound is fueled by many reasons: from its assumed role as a fleeting intermediate in a flurry of chemical reactions to its alleged properties as a wonder drug. Forgoing the past synthetic strategies that relied on the manipulation of neutral species, two students in Sanov's laboratory created OCCO from its negatively charged ion and used a highly advanced technique called photoelectron imaging spectroscopy to analyze the product. This technique uses laser pulses to eject electrons from molecules, effectively yielding "a portrait of the molecule viewed from within," as Sanov put it. Chemists have pursued the OCCO molecule off and on since 1913, when its existence was first suggested. In the 1940s, at a particularly controversial turn in OCCO's history, it was claimed to be the active component of Glyoxylide, a purported antidote for a long list of afflictions, from exhaustion to cancer. The claims were classified as fraud by the U.S. Food and Drug Administration, because the wonder drug proved to be nothing but water. Nonetheless, to this day the myth of Glyoxylide as a "lost" cancer remedy continues to be perpetuated on the Internet. According to Sanov, one of the motivations for pursuing ethylenedione is the elegant fundamental puzzle that the molecule presents: Most students with elementary chemistry education can draw the straightforward structure, O=C=C=O. Over the years, the anticipated existence of OCCO also has been backed by predictions of sophisticated theory. However, all past studies failed to provide conclusive experimental evidence that ethylenedione exists—and therein lay the puzzle. "We are not talking about some complex compound here," Sanov said. "This is a small molecule with only four atoms and an 'obvious' structure. Shouldn't modern science be able to tackle it?" "Radicals and diradicals are all around us," Sanov said. "Think of them as molecules with unpaired electrons that are 'underemployed' and looking for action. This means that they are eager to react, because the making and breaking of chemical bonds is controlled by electrons. A radical is a molecule that has one such 'underemployed' electron. A diradical has two." From a spectroscopist's point of view, OCCO's properties leave the molecule with no reason to evade detection, he explained. "And yet, it had never been observed, neither as a substance nor as a transient species, despite a century-long history of attempts," Sanov said. Until now. More precisely, until the day when Andrew Dixon, a soon-to-be fifth-year doctoral student in Sanov's lab and the lead author of the paper, opened the fridge and spotted a flask labeled "Glyoxal." "We started with a general interest in diradical systems and as part of those experiments, we decided to purchase some glyoxal, a precursor that is widely used in industrial applications but has not been explored as a potential synthesis molecule because its high water content makes it very difficult to work with," Dixon said. "Once we had bought it, we looked at it and I remember thinking, 'Oh man, this has 60 percent water. Let's figure this out some other day.'" During a conversation with a colleague, Dixon became aware of a compound that functions as a "molecular sieve," stripping the glyoxal solution of its high water content. "Once we had it in the gas phase so we could analyze it in our mass spectrometer, it turned out to be a good sample to work with, giving nice signal intensity," Dixon said. "We tried to find a name for the molecule that we were making, and a Wikipedia search pulled up ethylenedione. That's when we noticed it was something new." "We tried to rule out every other possible solution," said co-author Tian Xue, who will be a senior undergraduate student in the fall, "to make sure it wasn't some other anion that could pose as OCCO." To snap a "portrait" of the elusive species, they then unleashed lasers of short duration and precisely defined energies onto the molecules they produced. "We can create a beam of ions, and as they travel into the mass spectrometer, different molecules travel at different speeds, which allow us to separate out our ion of interest," Dixon explained. 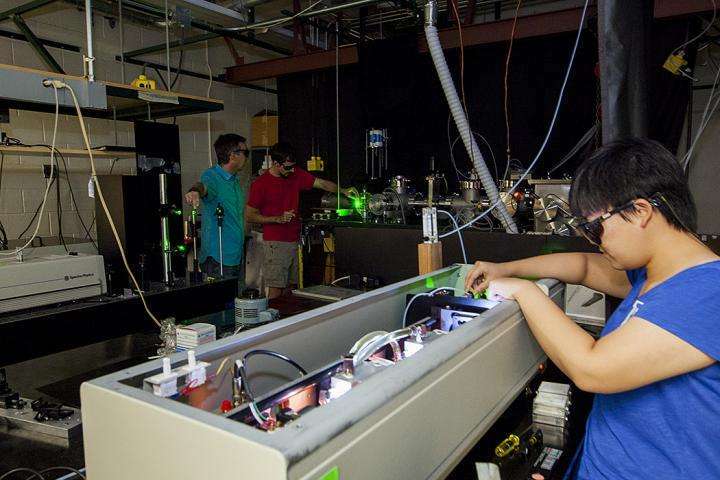 "In our window of interest, we can pulse the laser right when the expected OCCO anion is passing through." 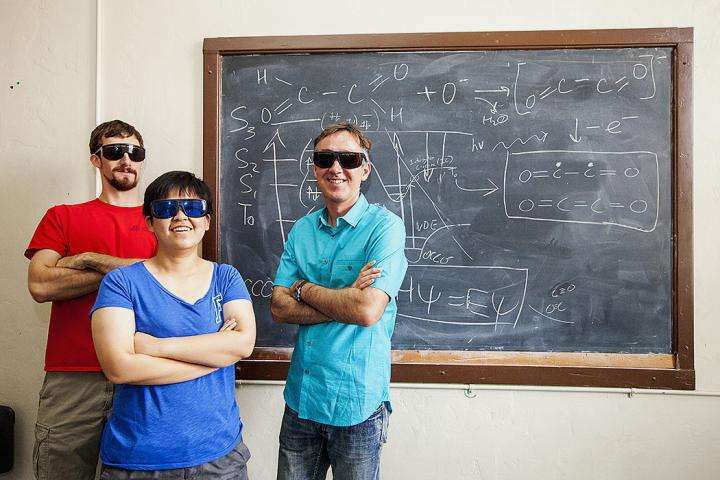 Using the laser pulses, Dixon and Xue were able to shoot off excess electrons from the stable anion of ethylenedione. They then captured photoelectron images of the quantum states of the resulting neutral OCCO at the very beginning of the molecule's lifespan, which lasts only about half a nanosecond. "This seems very short by human standards, but is in fact a long lifetime in the molecular realm," Sanov said. In light of the fact that glyoxal, OCCO's precursor molecule, plays a big role in atmospheric chemistry, Dixon speculates on the possibility that OCCO itself might also play a role, with potential implications for the modeling of atmospheric processes. "Given that glyoxal, its precursor, is a known pollutant and byproduct of combustion processes, whether man-made or natural, and given that OCCO seems to be a trivial molecule to create in our methodology, it is possible that it too could result from such processes, which, if true, could make it an unknown player in the atmosphere," Dixon said. "And if you don't know there is a species that you should be accounting for, your model will never be completely correct." "One important result of our work is the end of the long-standing controversy surrounding the existence of this molecule," Sanov said. "The theoretical predictions were correct—the transient OCCO diradical does exist. We have finally found it.